In the past few months, I’ve been working on a project in my spare time called Dockumo. 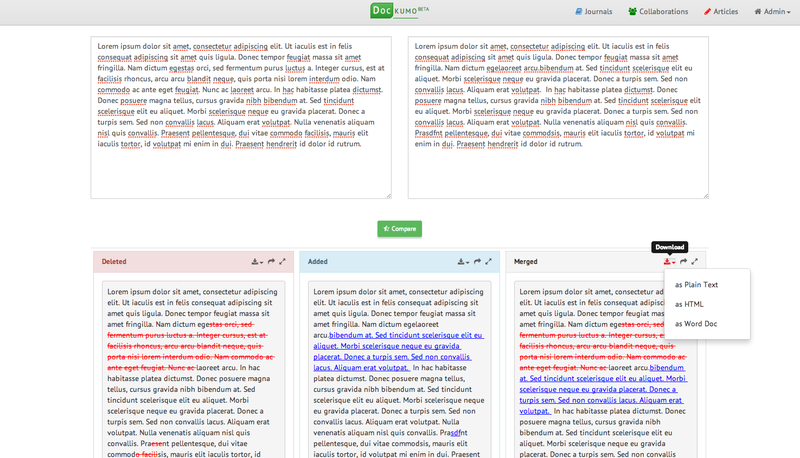 Dockumo is a web-based tool that lets users create “Articles” or basically blurbs of text, edit them and create new versions of them easily. When a user edits an article, the user is given the option to “Save” it or “Save as New Version.” Saving as a new version will generate a “Series” for the article, which will then start keeping track of all versions of the article. Pretty basic stuff. It’s my first foray into making consumer-facing software, including making better software tools for lawyers (my ultimate goal). The utility here is that the user can see the article and versions through a timeline view and can easily compare any two versions (or any two articles for that matter) with a couple of clicks. I built this because comparison before required making two word documents, saving them, then comparing them and saving the result. Dockumo does this, but makes it much faster to do. Also, there’s no need to store lots of messy versions on your computer since it’s stored in the cloud. Furthermore, I built in some functionality to export the result to a text file, html doc or word doc (word was by far the most challenging). Exporting actually keeps track of the changes in “Track changes” format in word, which I implemented through a modification to the node.js officegen module. Finally, Dockumo lets users group articles together in “Journals.” Journals are a way to get related content together and then to share them with your friends or other users on the site. When you share a journal, it becomes a “collaboration” for all users who are invited. Those collaborators can add new versions of any articles grouped in the journal. The idea behind this is that users will be able to view and edit data together, while keeping track of new versions. There’s an option, for instance, to receive a notification whenever a collaborator edits a series. So for example, if five users are collaborators on a journal who are working on a report or a term paper, each one can make his or her modifications and save as a new version. 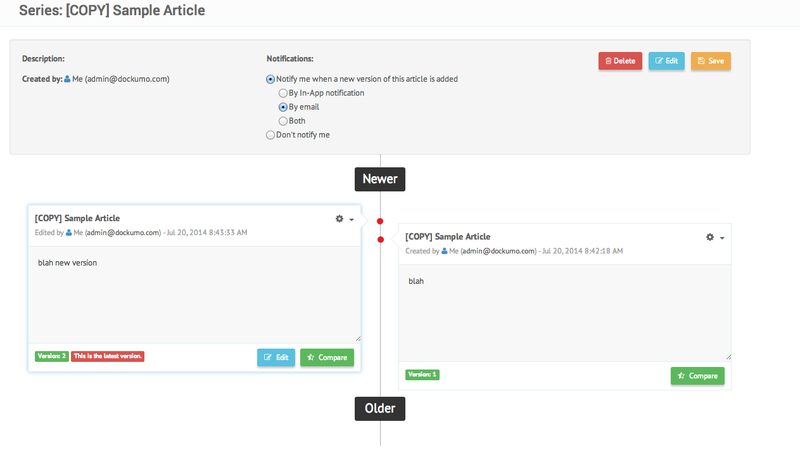 As the document evolves through time, each user can see which other user made the change and how the article changed overtime through the comparison view. When I started out making Docukmo, I only intended it to be a quick and easy way to diff two blurbs or text. I didn’t want feature creep to set in, but it inevitably did. 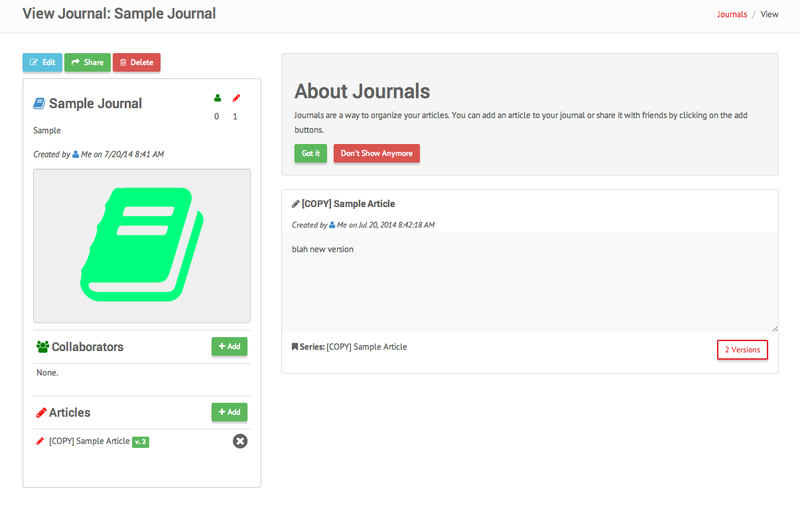 Journals were not planned from the beginning, but I figured users would want a way to see relevant content. I ended up having to add lots of other elements as well, such as “friending” other users, user search, a notifications system, exporting to other formats, and emailing users who want updates, user permissions. All of these things added complexity and time. A good lesson for me though: When I thought I was able to launch the website, I was actually still about a month out. It wasn’t until I tried to launch did I realize that there were so many niggling things left undone. For instance, not allowing users to register under the same username or email address, or giving a password reset mechanism. Fortunately, I can carry over a lot of this code to any future projects down the line. And feature-creep. I am probably the worst-offender of this concept ever. I always think to myself, “well if the software doesn’t do [X], then users won’t want to use it!” For me, this is an ever present temptation to continue adding feature upon feature to the source while never actually launching. Since launching, there have been other features that I really want to add (and probably will). For instance, I want to give users the option to make articles “public” and tag them with keywords so that the community (all users within the cloud) can search for a particular type of document (e.g. a cover letter or a thank you note), see an example of a it, and suggest modifications and rate existing articles. In other words, have a community of contributors who persistently improve cloud-based, crowd-sourced documents. That’s why I called the product “Dockumo”, or “doc” + “kumo” (“cloud” in Japanese). Let me know what you guys think. I’m always happy to discuss improvements I can make or my technical/architectural decisions.